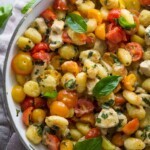 You are going to love this caprese chicken gnocchi skillet! It is packed FULL of summery flavors, has only 7 ingredients, and cooks up in one pan! Does anything in this world beat fresh summer cherry tomatoes? I really think not. Sadly I am 100% cursed when it comes to growing my own tomatoes. If the hail doesn’t get them, the aphids and spider mites will. And if not for the bugs, the crows will come for them. I seriously had to scare a family of crows off my cherry tomato basket one year. 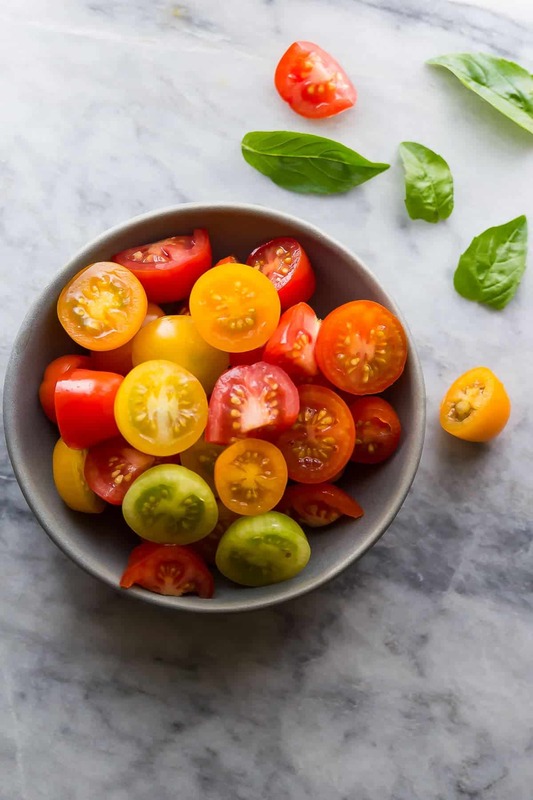 Luckily for me, there is this little thing I like to call the farmer’s market, which has a rainbow of delicious fresh tomatoes for me, no work involved. Yay! Today’s caprese chicken gnocchi skillet is a riff of this popular one pan gnocchi with sundried tomatoes and white beans. This time, I gave it a summery twist! 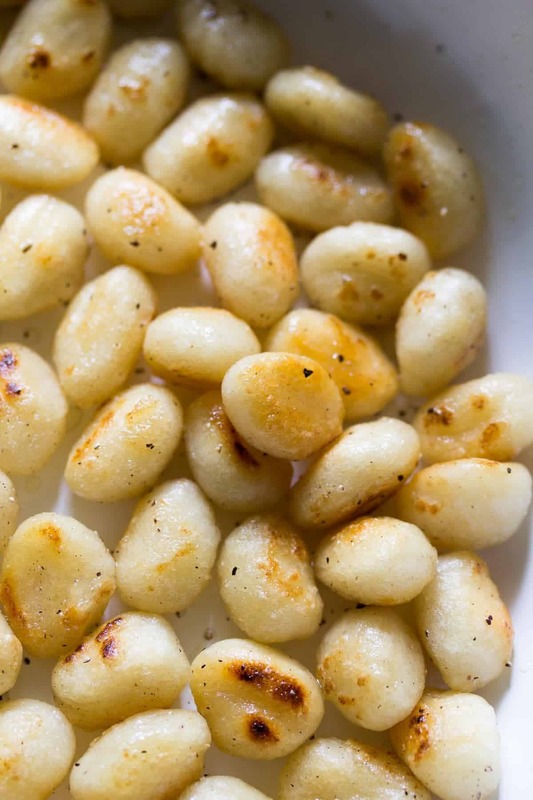 Have you ever tried pan-fried gnocchi? I won’t eat my gnocchi any other way! I originally saw Nigella fry up some packaged gnocchi until it got crispy, and tried it out myself. The texture is beyond words. SO much better than the super soft boiled gnocchi, this way it has a crispy outside and soft inside. And even better: it means you don’t need to boil a separate pot of water to cook the gnocchi. Don’t you love it when shortcuts actually taste better?! I went SUPER simple with this recipe. There are only a few easy ingredients: cherry tomatoes (obviously), fresh basil, and mozzarella. I added some chicken for protein, but it’s pretty filling even without the chicken so consider it optional. That’s it! How simple! I love eating this type of meal in the summer where the fresh summer produce gets to shine through. 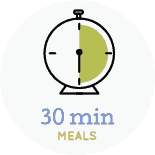 And it’s only 30 minutes to make, meaning less time standing over the hot stove, and only one pot means less time standing over a sink full of dishes. 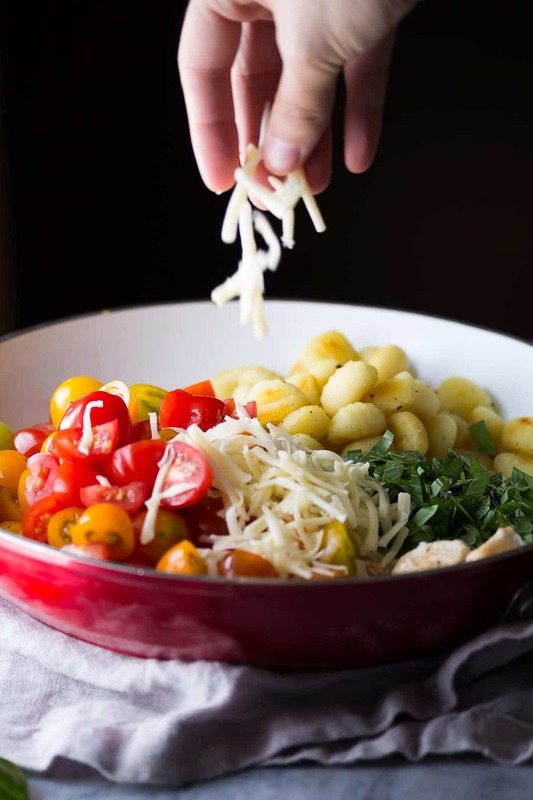 Friends, I love this caprese chicken gnocchi skillet so much, I even made a video to show off HOW EASY it is to make! Heat olive oil in a large non-stick skillet over medium heat. Add the gnocchi and season generously with salt and pepper. Cook, stirring occasionally for 15-20 minutes, until gnocchi is golden brown and slightly crispy. You may need to add additional olive oil if the pan gets too dry (it helps the gnocchi get crispy). Remove the gnocchi from the pan and set aside. If needed, add another tablespoon of olive oil to the pan. Add the chicken, season with salt and pepper, and cook for 5-7 minutes, until cooked through. 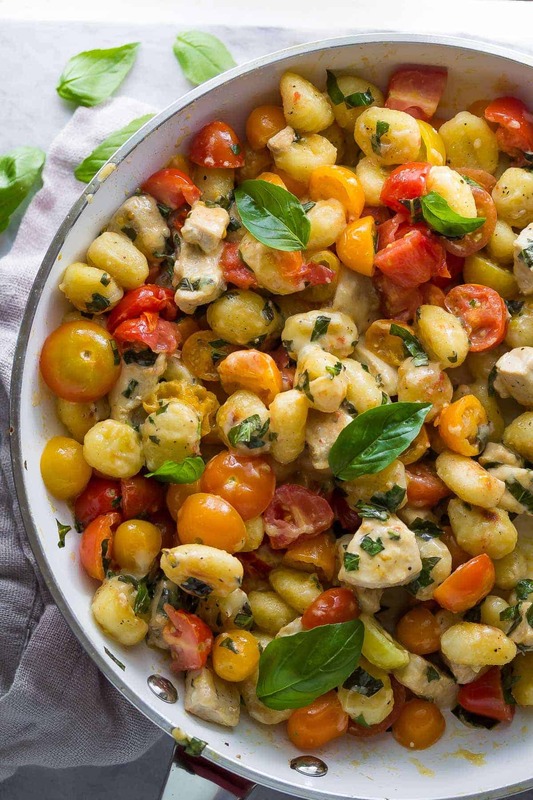 Return the gnocchi to the pan along with the tomatoes, basil and mozzarella. Stir 1-2 minutes, until cheese is melted through. Serve immediately. Delicious! I’ll never boil gnocchi again! Yeah! Happy to convert you, LOL! Could you make this ahead for lunch prep meals? My family loved this recipe!!! Hi Rhonda! Awesome, so glad you liked it, and love your additions! This was ahhhh-mazing! I somehow forgot to buy basil so I used a bit of pesto in its place. Is never toasted gnocchi before, and oh my goodness was it delicious! I couldn’t stop eating it from the bowl while I cooked the chicken. Love the easy cleanup too. This is a keeper! Hi Lori, I’m SO glad you liked it! I was definitely snacking on those gnocchi while the chicken cooked too 🙂 Thanks so much for your comment! 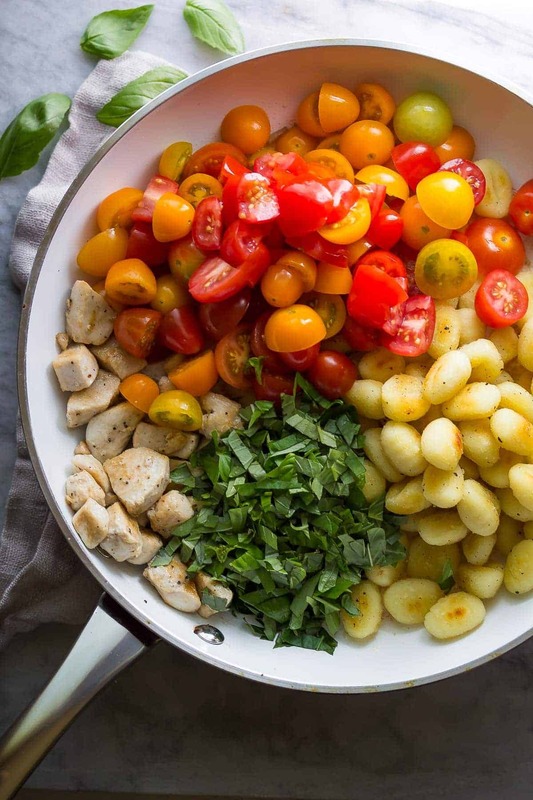 I’ve never cooked gnocchi and I need to add it to my grocery list because this caprese skillet looks epic! I need to add gnocchi to my shopping list, stat! I’ve never fried it but this skillet dish looks so great!